south me Southern Ocean hai. Scientist log batae hai ki million saal pahile khaali ek ocean rahaa, aur jaada kar ke jamin saathe jurra rahaaa jahan pe abhi Atlantic Ocean hai. Dhire dhire ii fat ke kuch tukrra me oe gais. Dire dire ii faarr me paani bhar gais. Atlantic Ocean ke west me North America aur South America hae. Ii Denmark Strait, Greenland Sea, Norwegian Sea aur Barents Sea se jaae ke Arctic Ocean se mile hae. Iske east me Europe hae aur ii Strait of Gibraltar se Mediterranean Sea – se mile hae. Southeast me Atlantic, Indian Ocean se mile hae. 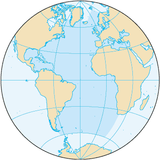 20° East meridian, jon ki Cape Agulhas se Antarctica talak south me jaawe hae, iske border hae. defines its border. Some authorities show it extending south to Antarctica, while others show it bounded at the 60° parallel by the Southern Ocean. In the southwest, the Drake Passage connects it to the Pacific Ocean. The man-made Panama Canal links the Atlantic and Pacific. Besides those mentioned, other large bodies of water adjacent to the Atlantic are the Caribbean Sea; the Gulf of Mexico; Hudson Bay; the Arctic Ocean; the Mediterranean Sea; the North Sea; the Baltic Sea and the Celtic Sea. Covering approximately 22% of Earth's surface, the Atlantic is second in size to the Pacific. With its adjacent seas, it occupies an area of about 106,400,000 square kilometres (41,000,000 sq mi); without them, it has an area of 82,400,000 square kilometres (32,000,000 sq mi). The land that drains into the Atlantic covers four times that of either the Pacific or Indian oceans. The volume of the Atlantic with its adjacent seas is 354,700,000 cubic kilometers (85,100,000 cu mi) and without them 323,600,000 cubic kilometres (77,640,000 cu mi). Ii panna ke 29 March 2015, ke 08:13 baje, pichhla time badla gais rahaa.